Wn05 Franceville West, K.V.U.Gr Riva-Bella, K.V.Gr Caen. Wn05 Franceville West is situated in an area of salt flats and tidal marshes. The sea has receded since 1944 and what was on the beach is now well inland. You can drive in and there is a large car park and walking around is Ok but some of the undergrowth is very thick and some items are hard to find. 2 x L413 Ammunition bunker for 3.7cm AA batterie. 1 x R504 Anti-tank gun bunker with group shelter. 1 x R506c Casemate for a 4.7cm anti-tank gun(t). 1 x R506d Casemate for a 4.7cm anti-tank gun(t). 1 x R669 Casemate for field guns (60°). 1 x Vf1a Shelter for six men. 3 x Vf2a Group shelter. 1 x Vf6a Observation post, shrapnel-proof. 2 x Vf3/SK Square MG pill box. 1 Ringstand Pz. T FT17 tank turret. 3 x 4.7cm Pak K.36(t). A 1940's air photo showing many of the features. 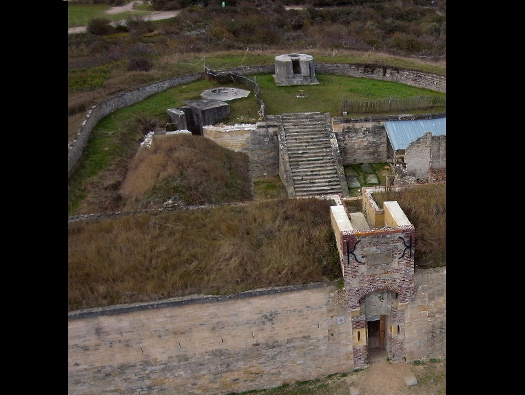 The Redoute was a French fort covering the east side of the Orne estuary and on the other bank in Ouistreham there is another Redoute turned into housing. A large ant-tank ditch covers the rear of the Wn and some very early style bunkers in use here. Right on the waters edge this Tobruk helped cover the left flank of the defence. It would have had sand almost covering it and just the rim showing. How the Tobruk may have looked. This maybe an R504 gun garage. We did not get close to it but this boy seems to have found it. R504 gun garage with an attached group shelter. R669 casemate for a field gun. A 7.5cm F.K.38 was assigned to this casemate and would have completely covered the Orne estuary locks and port area. 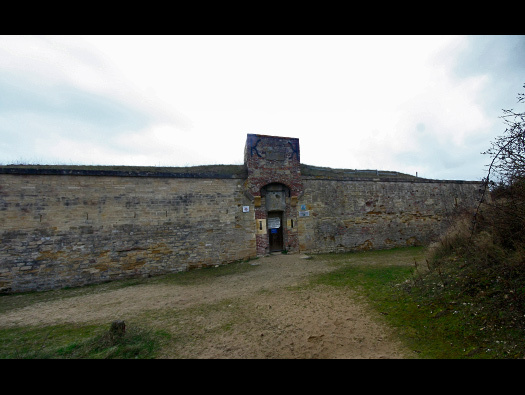 7.5cm F.K.38, they used old or captured guns in these casemates and crewed by the infantry stationed here. Being an important gun covering the estuary, it would have become an important target for allied naval and air artillery and it looks as though it did. 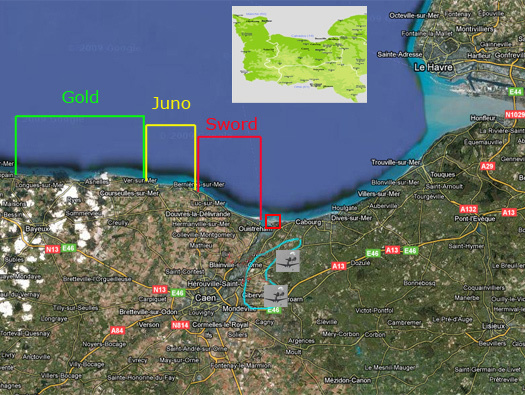 The Allied Bigot intelligence map showing the R669 and possibly the Tobruk or a Skoda gun that was around here. R669 plan showing is 60° gun traverse. The rear entrance with two ammunition niches each side. R669 plan also showing the pipe work to remove foul gases when the gun is fired. The gases were sucked into the roof vents, through pipes built into the concrete and led out to a vent at the rear. Armoured extraction vent. Nearly always set at an angle for some odd reason. Gun room where the 7.5cm gun would sit. Gun room as it may have looked. Now covered in undergrowth, but in 1944 it would gave had a very good field of fire of 60°. Painted on the walls are quick reminders of the main features that can be seen through the embrasure. A very handy and quick method of targeting your gun and used on many bunkers. A close-up showing the channel of the Orne and the fingers of the two Moles with a marker tower on the end which would have had a navigation marker lit when ships were entering or leaving the port. On the other-side you have the lighthouse, town and church. ZF 20E sights for a field gun. Quadrant for an 8.8cm F.H. Lighthouse 1675meters, town 1727meters and church 2550meters. Wn05 Franceville West wild life. The view of the Wn and you can see how hard it is to find everything. R504 Anti-tank gun bunker with a gruppe shelter. This is a gun garage stored in safety a 4.7cm Pak K36(t) gun. Earth/sand would be banked up to the door so a gun could be wheeled in and out easily. R504 Anti-tank garage with two crew rooms. 4.7cm Pak being pushed out of its garage. Inside the garage where the gun sat.. The hinges all that is left of the double steel door. This looks very like an R504 garage with small steel doors. The two grooves each side for the wheels of the gun to run in and then onto two steel channel runners sitting on two or more brick piers and then resting on the ones on the far wall. If you look on the far wall is a recess for the barrel of the gun to sit. An elevation of an R504 garage with the steel runners resting on block piers. The steel channel to run the gun along. Helmets and gas masks on a shelf. It may have been a small 57P8 type. Crew room. Note the hooks on the ceiling to hang beds from. Close up of the bed hooks. Three high, they can be unhooked and folded up against the wall to make more space for the crew. Gas lock and large close combat embrasure that would be bolted onto the square hole in the concrete. R506c casemate for a 4.7cm anti-tank gun(t). 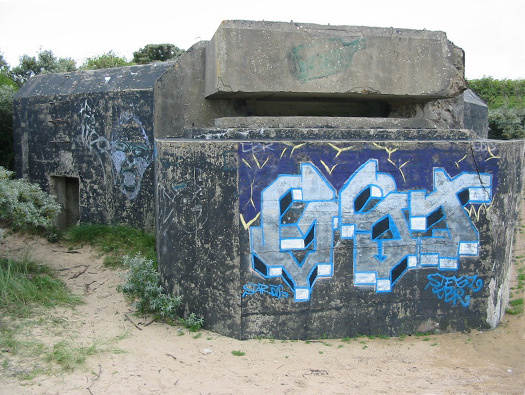 This is a huge bunker with gun room, crew room and ammunition room with a flanking wall and a Tobruk defence. Elevation showing the gun room & ammunition room. Also the pit in front of the gun for spent ammunition shell cases can be stored until after the battle and stops them getting under the feet of the gunners. The guns embrasure, flanking wall on the left and Tobruk on the right. This is an early model 1939, later models used a lot less concrete. Inside a Skoda bunker, the slot on the left is a viewing slot for the gun commander. 770P4 embrasure for a 4.7cm Pak K.36(t) gun. An outer shield (now removed) could be wound up by a geared handle (its a heavy plate) or lowered to fire the fortress type Skoda gun. Raising and lowering handle next to the gun. Gun room. The door to the ammunition room and the right door is into the crew room. A plan of the embrasure from inside of a Skoda 4.7cm Pak fortress gun. Skoda 4.7cm gun and crew. 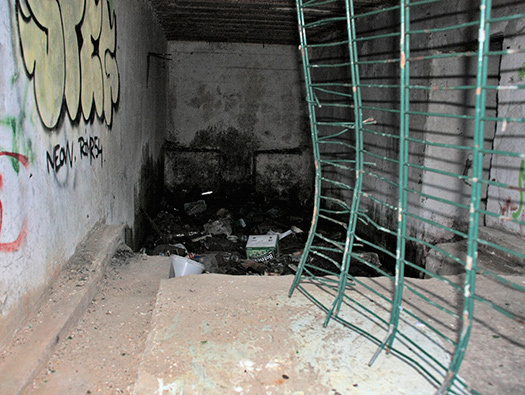 Rear entrance covered by a close combat embrasure where a machine gun would cover the entrance from attack. This is where the sea should be. Where steel screw type pickets were set into the concrete and barbed wire attached. This was the fire direction post for the battery a Wn01 Merville, B.-St 1./A.R.1716. A 1942 model observation post for a field artillery batterie. A very small observation room and a larger crew room behind. The small escape which would have had a square or half round wall built up the side of the bunker and sand would have covered up almost to the roof. There are still iron ladder rungs going up the wall. The different types of walls around an escape. Looking into the escape from outside. We did not go inside, some of these bunkers can be very unsavoury here. The shutters that fitted into the outer slots. 410P9 escape as proof door. The roof which looks as though a tar coating to seal the concrete and sad would have covered over it. The hooks were to attach a camouflage net covering the entrance. Camouflage netting being hung off a bunker. It looks as though it took quite a battering. It would have been targeted on D-Day to help silence the Merville batterie. HMS Arethusa was directed to fire in this area. HMS Arethusa, HMS Danae and HMS Mauritius sailing for D-Day. MG. Stand and possibly a 4.7 cm Festungspak. Not at all sure what this bunker is/was???? The view through a crack in a door. 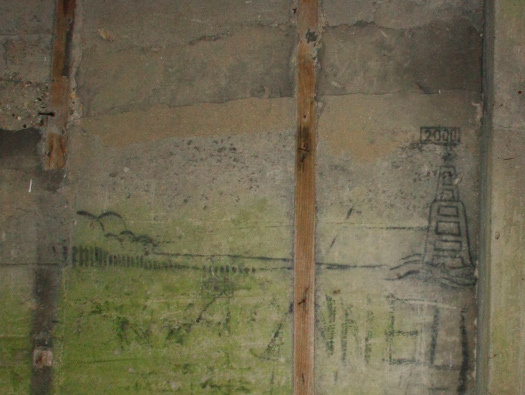 The added concrete camouflage plastered on the top of the bunker walls. La Redoute Merville Since 1984, an older fortification mobilizes the efforts of an association of enthusiasts and public authorities: the Redoute de Merville, listed as historical monuments. 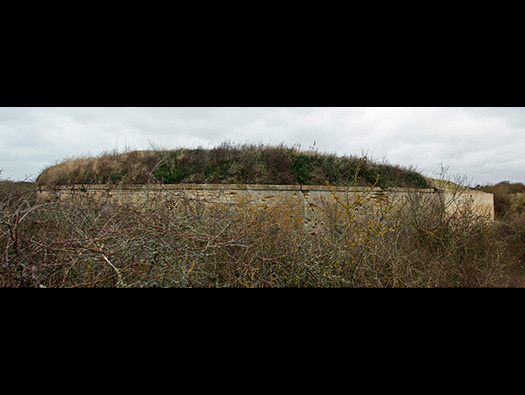 This little horseshoe-shaped fortress belonged to a set of three carrying artillery, built in 1779-1780 around the estuary to strengthen defences against England. La Redoute was then surrounded by the high tide. Tour occupied and abandoned tower inserted into the device's Atlantic wall and then abandoned and buried under the sand, it is the subject of an ambitious restoration program. The view through the gate at the U Type Tobruk for a 3.7cm KwK144(f). F.T. 3.7cm KwK144(f) turret in a U Type Tobruk. U Type Tobruk for a 3.7cm KwK144(f). Left ----- MD 8.14cm Gr.W.278(f) Mortar Tobruk. Middle - U type Tobruk. Right --- 8.14cm Gr.W.278(f) Mortar in an open position. Mortar Tobruk with an ammunition storage behind. This could be an L413. L413 ammunition storage for a 3.7cm Flak 38. On the horizon you can just see a Vf3 MG Stand. Well Randum in German translates to Random in English, so its a very random machine gun shelter?? 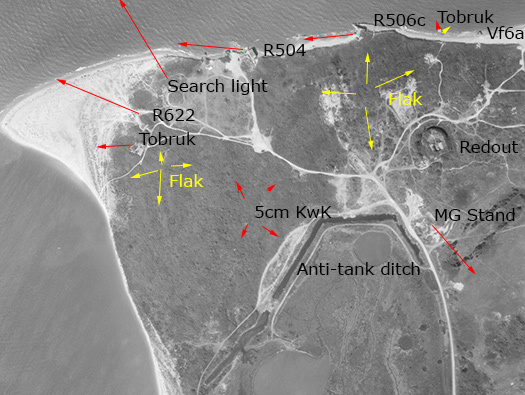 I would think its a position with a telephone link to the local HQ and it was used as a lookout all over the Wn and could if needed become a machine gun bunker to defend its self. Emergency escape. This would have to be broken open from inside to escape if the main door became blocked. Main door and the left the escape hatch. I am not sure what this was. I am not sure what this was the books say a Soute (hold translated) it may have been a French gun position when France extended its Maginot line around the coast after WW1 and a field gun may have used it as a ringstand. Vf2a passage way with the entrance to the bunker on the right.